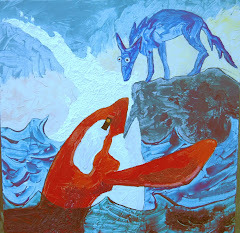 Often in the series called "Blue Coyote & Friends" images arise first as titles. As I emerged from sleep one early morning, this title was my first waking thought: "Eagle Man, Buffalo Dreamer, and the Dead Cow." Weird, I thought, what can it mean? I trust this process, and after breakfast started a sketch. 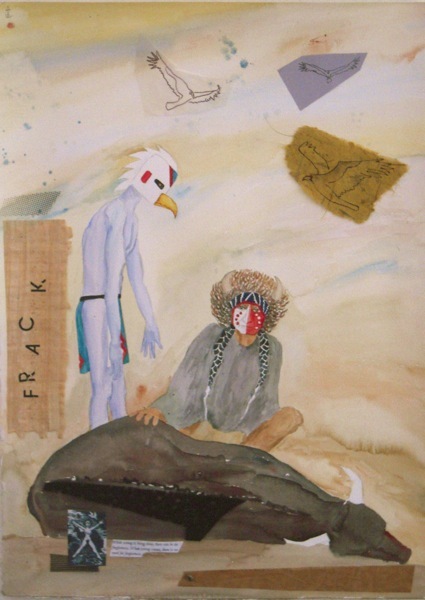 Eagle Man and Buffalo Dreamer are familiar characters, but how exactly does a dead cow look? I went to my computer and googled "dead cows." Before I even finished typing, the menu showed "dead cows fracking." Omigod. No wonder I trust this process! Here is spirit, feeding me the title of a protest piece about something I didn't know to protest. Of course, I oppose fracking. I knew about devastation to land, water, people's homes. I knew about nosebleeds, rashes, kidney damage. But I hadn't known that cows were dropping dead on their farms. Well, cows are dropping dead on their farms. And this watercolor and collage piece is a witness to our need to recognize their danger as our danger. Two powerful spirit guides—and attendant vultures—remind us that the health of every being is tied to our own health. Eagle Man and Buffalo Dreamer love this earth. So does Hybla, the small figure pasted over the back of the cow in the lower left. Hybla is a Sicilian earth goddess, out to block our destructive habits and restore health to all beings. I often feel the presence of many beings—plants, animals, and spirits—all fervently wishing us to wise up and take our respectful place in the community of life. This little painting is one expression of their great wish.